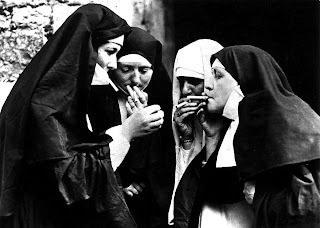 GodSpam: Is Catholicism Like Smoking? We don't lose habits, we replace them with better ones. I thought she grew Catholic and then left the Church, later coming back. 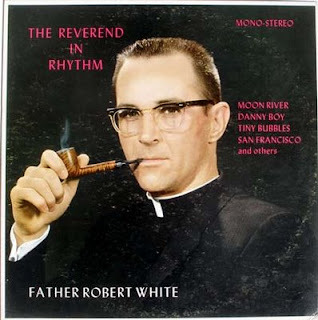 Now of course pitching organized religion all together. Yes, she grew up Catholic and left the church as a young adult. 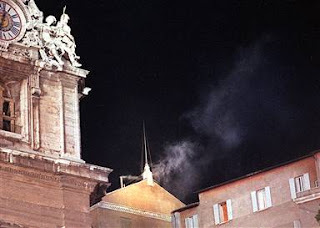 Way to go, Catholic Church. Ordaining women is now a grave sin comparable to molesting a child??? One more reason to never go back...when the Church considers half of the world as second class citizens (women) while those with the correct genitalia and ordination are allowed to get away with truly grave sins. Sad, sad, sad. Ha, thanks K. I was paraphrasing Rice's quote and didn't catch the obvious. The photo progression is absolutely brilliant. In particular, that last one is pure genius. Christ, I love the smoking Jesus and smoking Penguins. So that is what killed Jesus. "Holy Communion" is only Jesus in a piece of bread. Just image ordained women hearing confession and catching up with the day's gossip. I am a bedraggled refugee from the "Holy" Roman Catholic Church, no proudly Atheist. 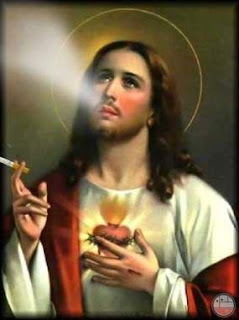 one picture of smoking Jesus contains secret pedo-code..should remove it..or name it..